For over three decades, Casio’s G-Shock watch line has maintained its place as one of the world’s leading brands of durable watches. Considered by many to be the “ultimate tough watch,” the G-Shock is designed to weather all your adventures: it’s water resistant, shock resistant, and self-adjusting, with several models running completely on solar power. But beyond functionality, G-Shock refuses to take a backseat to fashion by combining its cutting-edge technology with the latest cultural trends and collaborations—including many of the anime classics otaku know and love. Keep reading to see what limited edition G-Shock anime collaborations you’ve been missing out on and how you can get one on your wrist straight from Japan! In 2014, two limited-edition Gundam G-Shock watches based on the GD-100 model were released in commemoration of Mobile Suit Gundam’s 35th anniversary celebration; and while they may not be Gundam’s first collaboration with Japan’s esteemed watch maker, they’re undoubtedly the coolest. The white GD-100 model takes inspiration from the legendary Gundam RX-78-2 and was so popular on its release that it sold out in less than 24 hours. It’s jam-packed with references Gundam otaku will easily recognize: the EFSF (Earth Federation Space Force) logo on the watch face, the Amuro insignia which appears when the LED backlight is activated, and the Gundam RX-78-2 helmet engraved on the back casing. Based on Char Aznable’s notorious nickname, “The Red Comet,” this red G-Shock model captures the sleek, glossy look of Char’s mobile suit—from the watch’s crimson face and black negative display panel, down to the pink Mono-Eye. This G-Shock features a high-luminescent LED, instantaneous times from the world’s 48 major cities, an alarm clock, stopwatch, and more, and is sure to make you feel like you’re at the control panel of your very own mobile suit! Considered one of the boldest and most controversial anime series of its time, Neon Genesis Evangelion collaborated with G-Shock to create the ultimate tribute to the series’ special edition release. The GA-110EV-6AJR takes its inspiration from the iconic Evangelion Unit 01, whereas the GA-110PS-7AJR is themed after the Plugsuit of Evangelion Unit 00 pilot, Rei Ayanami. Featuring texturized designs and transparent, mechanical faces, these Evangelion G-Shock watches capture all the elegance and edginess of one of anime’s most daring sci-fi series. Considered a cult classic among anime otaku, Akira’s G-Shock models commemorate the film’s 30th anniversary in sleek style. Both designs are limited to 1,000 units worldwide and come in manga-inspired, decorative tins. Created by the “Father of Manga,” Osamu Tezuka, Astro Boy is considered the very first hit anime series and remains Tezuka’s most notable creation. Over the years, G-Shock has collaborated twice with the Astro Boy franchise, creating a pair of unique timepieces featuring Japan’s time-honored character. The Astro Boy DW-5600 marks the “Mighty Atom’s” 60th anniversary and features a vintage, manga-covered case and a backlit image of Astro Boy in flight. The Astro Boy DW-6900 was created a few years later to pay homage to Osamu Tezuka’s 80th birthday anniversary; though Tezuka died at age 60, this G-Shock model is another hopeful reminder that his legacy will live on until the end of time. With only 2,000 watches in existence, the limited-edition Tony Tony Chopper Baby-G is the buried treasure you’ve been searching for! Its pastel color scheme taken from Chopper’s fuzzy top hat paired with the fashionably smaller Baby-G watch size make it ideal for female fans of the Straw Hat Crew’s tiniest member. Featuring LED lighting, animated display wheels, and an etch of the Cotton Candy Lover himself on the backside, this ultra-rare Baby-G would make the perfect gift for any One Piece otaku. Capturing all the magic of the Sailor Senshi, this special edition Sailor Moon Baby-G is as beautiful as the lunar heroine herself. The watch features a customized band and backlight, which display Sailor Moon’s graceful silhouette and iconic catchphrase, as well as a transparent Crystal Star case for safe keeping. Fortunately, you don’t need to form a contract with Kyubey to get your hands on this rare Puella Magi Madoka Magica Baby-G watch (though it might be just as difficult to hunt one down)! While the collaboration design elements may seem subtle compared to other watches featured here, switch on the LED and Kyubey’s ominous eyes will quickly convince you otherwise. Fact Check: Is the Doraemon G-Shock Legit? Doraemon, the robotic cat with an ability to summon any gadget he needs, might seem like the perfect fit for a cutting-edge watch brand like G-Shock, and a lot of knock-offs want you to think that a limited-edition collaboration exists. Unfortunately, fans of the fantastical feline will need to keep holding their breath as Casio has yet to announce anything but a warning. Casio has informed collectors that the so-called “limited-edition G-Shock X Doraemon GA-110” is, in fact, a fake color-over that originated in Thailand and is not authorized by Casio. These bootleg watches come in at least three variants and have seen a lot of circulation in Southeast Asia, often appearing on auction sites. While it may be tempting to purchase a “Doraemon G-Shock,” be warned that these unlicensed products are not guaranteed to have the durability or water resistance of traditional G-Shock watches and as such are no longer under the manufacturer’s warranty. 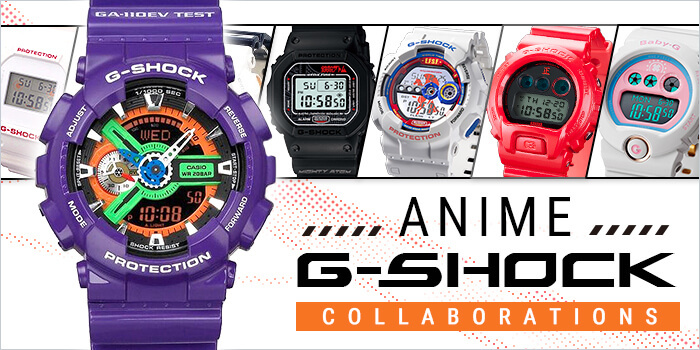 G-Shock anime collaboration watches are the stylish way to rep your fandom fashion, and limited-edition releases only make them even more coveted by collectors. Fortunately, you don’t have to travel to Japan to purchase the ultimate otaku timepiece. With FROM JAPAN’s online proxy and auction service, you can get these exclusive watches and more delivered to your door. G-Shocks sell out fast, so shop now before your prized watch is snatched away by another collector!